Direct Orthopedic Care (DOC) is hosting the inaugural Run for the Flag Veterans Day Race to honor wounded veterans and their families. 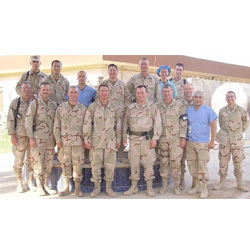 Dr. Merritt Pember, an orthopedic surgeon at DOC and a U.S. Army major, physician and veteran, served during Operation Iraqi Freedom in Baghdad. Dr. Pember, along with a team of DOC members, Emmis Broadcasting and People Powered Sports, created the Run for the Flag fundraiser. Dr. Pember was a surgeon at the 86th Combat Support Hospital in Iraq in 2005, where the documentary, Baghdad ER, was filmed during his service. The film documents war trauma in the ER, but also shows the heroism, courage and dedication of U.S. troops. Dr. Pember was reassigned to the 225th CSH in Mosul and served in Iraq as an orthopedic surgeon for six months. In 2013, Blake Lyman began his active duty service in the Navy and deployed with the Marine Corps the following year. He served in Kuwait for seven months with a shock trauma anti-ISIS unit called Operation Inherent Resolve. Blake was awarded a Naval Scholarship and earned his masters degree in physician assistant studies at Wichita State University. He is a PA-C with experience in urgent, family and orthopedic care. Merritt Pember is an orthopedic surgeon for DOC. Blake Lyman, William Fox are physician assistants for DOC. DOC is honored to have these accomplished healthcare professionals on the DOC team.